a brand new design. André Bénéteau created a hull with a dynamic tunnel, tests of which have proven the architect’s rational approach to the problems of stability, thrust and grounding. The calculated gradient of the windscreen and the radar gantry showcases the flawlessness of the sloping coachroof lines and the Flying-bridge. 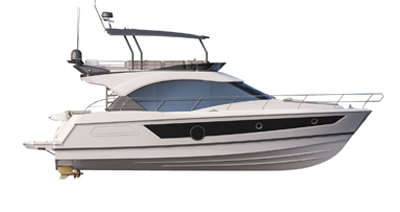 The Antares 9.20 is at home in the most frequented ports and anchorages.